It has rained and stormed almost the entire weekend. In fact, yesterday, I got 67 photos worked on, re-sized, and uploaded to the Recent Additions folder of my Zenfolio website! Yeah, very productive, but I must admit I would have rather been out taking more photos. It just seems like it is never, ever going to stop raining! I did, finally, get outside for a little bit yesterday evening, and that's when I snapped this photo. 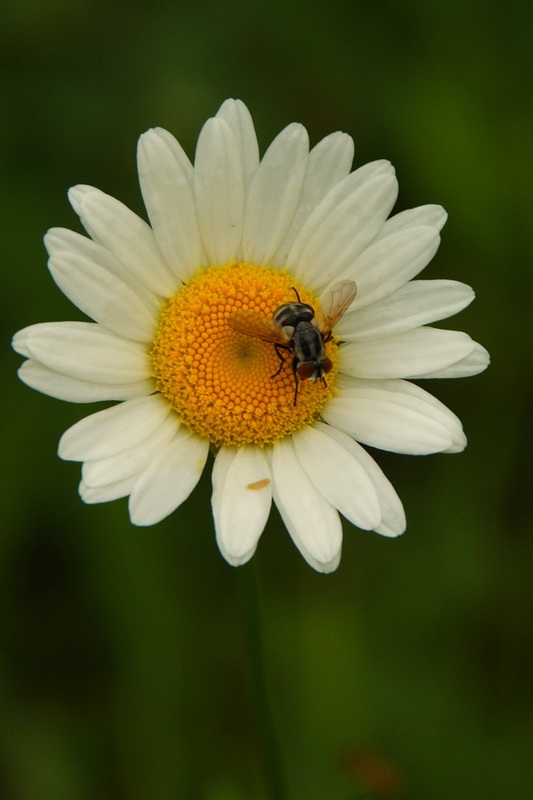 The Daisies are plentiful around the pond right now, and I liked this little fly. It was unique, because it had stripes on it. So, of course, I photographed it. I think I'm going to do some employment screening to hire some ANTI-rain dancers! We're gonna float away! To join this meme, which is full of beauty, click on the badge at the top of this post. Just beautiful, and enjoyed your little visitor. I've never seen one quite like him before. Great photo! Daisies attract a lot of different bugs don't they! Misty: Cute capture with the little Bee Fly. I like how the daisy almost seems to hang in the air. Cute capture and I love the daisy! You have posted amazing picture of flower. Flowers bring so much joy to those who have the time enjoy them. This is very pretty-lol- even if I don't like flies a lot! !